Minivan shoppers have long chosen the Nissan Quest as their next new family van, thanks in large part to the Quest's excellent list of features, exciting powertrain and comfortable cabin. For the 2016 model year, the Quest is carrying over most of its interior and exterior equipment, continuing its reign as a leading member of the minivan segment. 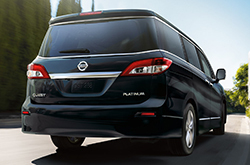 Continue to browse our full 2016 Nissan Quest review to learn all about this latest edition of the popular family van. 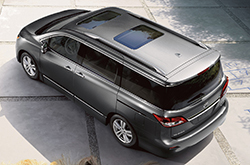 Shoppers looking for the 2016 Nissan Quest near Dallas will find the minivan is available in four trim levels: S, SV, SL and Platinum. Looking first at the entry-level S trim, this model of the Quest comes with 16-inch steel wheels, Nissan's Easy Fill Tire Alert system, keyless entry, cruise control, cloth upholstery, ambient interior lighting, pushbutton start and a tilt-and-telescoping steering wheel. The next-level SV model comes with everything from a leather-wrapped steering wheel, Bluetooth connectivity and tri-zone automatic climate control to a rearview camera, a 5-inch color display and satellite radio. The Quest SL adds 18-inch alloy wheels and a power liftgate to the minivan, as well as heated mirrors and front seats, automatic headlights, leather upholstery and an auto-dimming rearview mirror. Many 2016 Nissan Quest reviews have widely praised the range-topping Platinum model, thanks to its excellent premium and entertainment features, such as a 360-degree surround-view camera, xenon headlights, navigation system, 13-speaker Bose sound system, one-touch fold-flat third-row seats and rear DVD system. Other standard features on the2016 Nissan Quest in Grapevine include its wide variety of safety amenities, including antilock disc brakes, stability control, front-seat active head restraints and side curtain airbags. Power-wise, the 2016 Quest works off of a 3.5-liter V6 engine that generates an impressive 260 horsepower and 240 lb.-ft. of torque. The engine is outfitted with a continuously variable transmission (CVT) that provides exceptional fuel economy that family van shoppers will love. 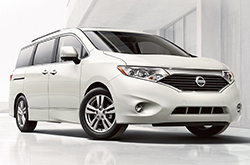 Stop by Texas Nissan of Grapevine soon to test drive the 2016 Nissan Quest. Our staff of dedicated sales associates are standing by now to help you find the right car for your family and your budget. We would like you to compare the most current Quest model next to competing vehicles like the 2016 Chrysler Town & Country, Toyota Sienna, Honda Odyssey and the Kia Sedona. That's how confident we are that it's perfectly built for you. Shoppers will be thankful for the Quest's eye-catching styling, as well as its cutting-edge cabin features. For Grapevine Nissan customers who want a spectacular value, just compare this vehicle's price to the aforementioned vehicles and you'll see that it's a good investment. Get more information - Look through our Quest Quick List below this text! We know your next Nissan purchase is important; that's why we've provided the 2016 Quest review above, along with reviews of prior models. We're a foremost car dealership in Grapevine for a reason, part of which is that we provide reviews written by seasoned writers who are at the height of their craft. Make sound decisions when it comes to your next auto purchase - don't take guesses! Each overview is brimming with information and vehicle features in a clear format that's easy to understand. Now that you've read Texas Nissan's review of the 2016 Quest, please message us to find out about incentives and current financing offers, so you can save a significant amount on your next purchase!